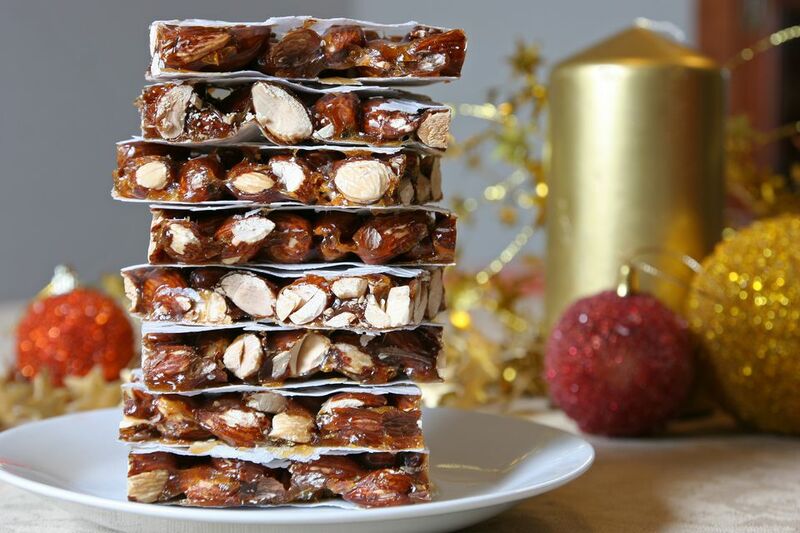 Turrón is a Spanish confection, traditionally made of nougat and nuts, that is often enjoyed at Christmas. Turron can be soft or hard, and nowadays is available in many varieties. The treat has evolved into other incarnations as it has made its way around the world. In Peru, for example, turron de doña pepa is flavored with anise and is made of cookies bound together with a sticky syrup. This soft and chocolatey turrón has a chocolate base filled with coconut and crumbled cookies, and is topped with a layer of white chocolate and toasted coconut. The candy can be sliced into pretty bars and keeps well, so it's ideal for gifting. Lightly grease an 8-inch square cake pan and line the bottom of the pan with parchment paper. Crumble the cookies, not too finely. In a medium saucepan, melt the chocolate chips, butter, and corn syrup over low heat, stirring often, until smooth. Remove mixture from the heat and stir in a pinch of salt and vanilla. Stir in the 2/3 cup coconut and the crumbled cookies. Spread chocolate mixture evenly into the prepared pan, and place in the freezer until firm. Preheat the oven to 300 degrees. Toast the remaining 1/3 cup of coconut until lightly browned, stirring occasionally. Watch the coconut carefully to prevent burning. Once it is lightly browned, remove coconut from the oven and set aside to cool. In a small saucepan over low heat, melt 2 tablespoons of shortening. Add the white chocolate chips and stir over low heat until melted. Spread the white chocolate mixture evenly over the chocolate mixture. Sprinkle the toasted coconut over the top, pressing it in lightly so that it adheres to the white chocolate. Chill until firm, then slice the turron into rectangular pieces to serve. Store turron tightly wrapped in the refrigerator, and let it come to room temperature before serving. Peppermint Chocolate Spoons- Easy and Cute Holiday Gifts!